Today I’m going to teach you how to make a Pasta fazool – the traditional Italian pasta and beans dish, also often called pasta fagioli. The version of this famous recipe you will be making today, of comes from Venice. As this is not a vegetarian pasta Fagioli recipe, my dear vegetarian and vegan friends will need to exclude only bacon, and then they will be able to enjoy it fully. Do you have your favorite Go-To Meal in the winter time? What is the first thing that comes to mind when somebody says Pavlova cake? My mind immediately gets filled up with the idea of a sweet and crunchy base with fresh whipped cream and fruit on top. Do you get the same kind of idea? I love Pavlova cake because there are many versions and it’s hard to say which one is the “best Pavlova recipe”! There is a Mini Pavlova, Large Pavlova, Wreath Pavlova, Layered Pavlova cake, Pavlova with flat meringue base or the one that looks like a cup. In all Italian families food is super important. Especially dinners. Even ordinary dinner times are some kind of a small feast. To keep up with the traditional rituals and give them a modern twist, I like to simplify the meals while still creating something different and exciting. For a long, I was planning to make these spicy tuna potatoes nests. Finally, I have made them on Thursday night (Friday is a pizza night) and they were a real hit. After battling with a piping bag, which is still a challenge for me. circle like I’m squeezing it too hard and potato puree was coming out on both sides. I guess its just something I will need to practice more! The potatoes nests came out pretty cool looking and even tastier than I have expected. Basically they were melting in the mouth. To prepare the potatoes I have used the Homemade Duchess potatoes recipe and then I have prepared the spicy tuna mix on the side. These potatoes nests can be easily accompanied by a seasonal salad if you are planning it to be your main dish, or you can serve it as a warm appetizer before the fish platter. If you like potatoes as a side dish, this a perfect solution for you. Using the recipes for duchess potatoes I have prepared the potatoes puree and placed it in the piping bag. 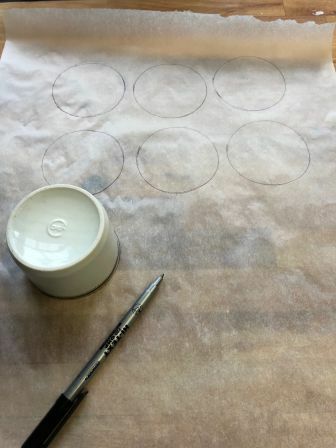 In order to know the exact size of each nest I have used the cup and pen to draw the circles on the baking paper. Once turned on the other side, the circles were still very visible and I could trace it with a potato puree. Drawing the circles on the paper will help you make same size nests. PRO TIP: Make sure you account for the nest walls and the hole you will leave empty for the stuffing. The nest will lower a bit during the baking time, so take that into account when creating the nest. Start by making the base of the nest first and then circulate on the edges to make the nests walls. The potatoes nests I have made were 6 cm in diameter, with an opening of 4 cm. Once all are done place them in preheated oven to 200 C and bake them for 15 min. 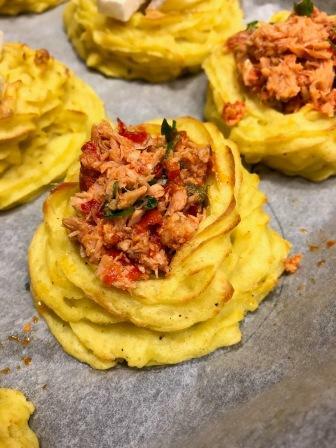 Create fun spicy tuna potatoes nests using the duchess potatoes recipe. How to make spicy tuna stuffing. My mother in law makes this amazing traditional chopped peperoncino sauce (chilly peppers) in olive oil. We use it often when we want to add a bit of spice to our food. Its chopped in small pieces and loaded with spice and warm flavor. I know that if you live outside Italy it’s hard to find a typical Italian peperoncino sauce, so I have done a lot of research and have found Tutto Calabria Hot Chili Peppers Crushed. This way you can have a taste of real Italian stuff. In case you didn’t know Calabria is based in the south Italy, to be precise, the tip of the boot. Now, since you have already done the biggest part of preparing the potatoes nests, the rest will be a piece of cake. You will need to mix following ingredients and you will have a delicious stuffing for your potatoes nests. Don’t you just love the pic of this spicy tuna potatoes nest – imagine its yummy taste! By now your potatoes nests should be ready to be stuffed with spicy tuna. Remove them from the oven and add the stuffing and place back in the oven for 10 minutes. If you have the grill in your oven use it. 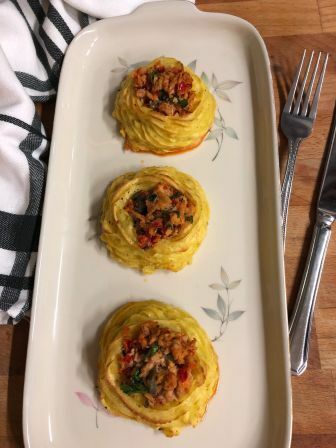 Before serving this delicious spicy tuna potatoes nests drizzle it with the extra virgin olive oil and give it another pinch of chopped fresh parsley. I hope that you will enjoy these delicious spicy tuna bites and that you will make them in many occasions. Show it some love and send it to your friends, share on Facebook and don’t forget to pin it on Pinterest. This is my go to appetizer when I'm preparing the fish based dinner. The spicy tuna is a perfect addition for your meal of it can become your main dish with a salad on a side. Crunchy on outside with creamy spicy stuffing will make your mouth water with every single bite. Prepare the potatoes mix following the homemade Duchess potatoes recipe. Place the mix into the piping bag and create the nests. First prepare the base and then the walls of the nest. 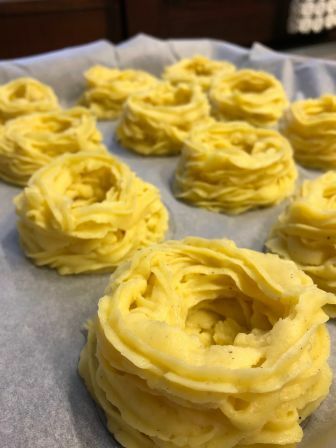 Once all nests are created, place them in preheated oven and bake them for 10-12 minutes on 200C (or until golden brown). In the mean time prepare the stuffing. Wash and chop the fresh parsley placing it into the bowl, drain tuna and add it to the bowl, together with peperoncino and salt & pepper. Once the nests are baked, take them out and while still on the baking tray fill with the spicy tuna stuffing. Place them back in the oven and bake for another 10 minutes (if you have the grill use it). Serve the potatoes nests warm, sprinkled with fresh parsley and drizzled with extra virgin olive oil. Have you tried homemade Duchess potatoes? This super creamy homemade duchess potatoes recipe will become one of your exquisite go to party treats. With its origin in French cuisine, duchess potatoes are part of a legend that says the French cook served them to an English duchess while she was visiting France. They liked them so much that they became legendary. While time has passed the duchess potatoes recipe remained and have won the recognition all over the world. How to make rolled zucchini with mozzarella and mortadella? We love zucchini and eat them at home very often. 2 weeks ago I have bought a new bunch and I wanted to try something different. I thought I would like to stuff them and I came across this super easy recipe. 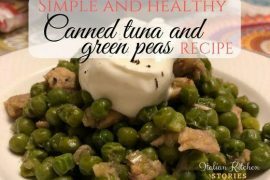 You will love this recipe too, it’s very simple, although requires time to prepare. I am definitely a person that likes new experiences, tastes, new things and with that comes experimenting with recipes like this stuffed eggplant from Naples. I just love the idea of how big and diverse Italy is, and how every region has its traditional recipes and favorite flavors. You can literally eat the meal that has the same name but different taste.